The Tennessee Pass Cookhouse encourages diners to earn their dinner by hiking on forest trails for about a mile from the parking lot to the Cookhouse yurt, where theyâll be treated to Colorado signature dishes such as elk tenderloin, rainbow trout and rack of lamb. Coloradans like to do it all, and it can be difficult to choose between that concert you’ve been dying to see and a weekend of hiking or biking. But why should you have to choose? We curated three summer weekend trips that bring you the best of Colorado’s culinary, cultural and outdoor offerings. That way, you can have the best of all worlds. Endurance athletes know Leadville as a training mecca, with its miles of trails, thin air and famous mountain bike and running race series. But did you know you could have a gourmet weekend there, as well? 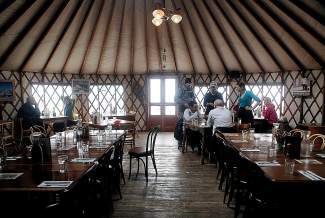 Skip the budget motel and instead book a yurt and dinner reservation at the Tennessee Pass Cookhouse and yurts (www.tennesseepass.com). The locale is about 20 minutes from downtown Leadville but feels like it’s a million miles away. The Tennessee Pass Cookhouse encourages diners to earn their dinner by hiking on forest trails for about a mile from the parking lot to the Cookhouse Yurt, where they’ll be treated to Colorado signature dishes such as elk tenderloin, rainbow trout and rack of lamb. Make a night of it by staying at one of the Tennessee Pass sleep yurts, which may be off the grid but don’t lack in comfort, warmth and coziness. They’re equipped with kitchenettes, furniture and solar lighting. It’s all a perfect excuse to sign up for one of Leadville’s well-known trail races (www.leadvilleraceseries.com). Test the waters on Sunday, Aug. 14, with the Leadville 10K run, an out-and-back course that includes the first and last few miles of the Leadville 100 run course on both paved and dirt roads. Looking for something a little different? On Sunday, Aug. 7, as part of Leadville’s Boom Days festival (www.leadville boomdays.org), runners and donkeys carrying traditional mining packs participate in the famous Burro Race. Don’t worry, you can rent a donkey, but make sure you’re ready to run 21 miles of backcountry trails. Those who want to jam and still play hard outdoors should look no further than the brand-new Vertex Festival in Buena Vista. Set against the backdrop of a number of 14ers, this music festival invites attendees to camp and experience live music on the grounds of a working ranch from Friday, Aug. 5, through Sunday, Aug. 7 (www.vertexfestival.com). Headliners include electronic duo Odesza, four-time Grammy winners Alabama Shakes and the Trey Anastasio Band, among many others. The festival is also designed to allow attendees ample time to enjoy the surroundings as well as the music. The event schedule offers daily yoga practice, stargazing opportunities and rafting excursions, getting adventurers back to camp in time for the music. It doesn’t hurt that the event is right around high season for kayaking and rafting on famous stretches of the Arkansas River, such as Numbers and Brown’s Canyon. As many Coloradans know, early August is also prime peak-bagging season, and Buena Vista serves as base camp for peaks that include Mount Princeton, Mount Harvard, Mount Belford, Mount Yale and more. Aspen leaves turn a magnificent golden in the High Country during September, and, as the trails clear at the end of the season, there’s no better time to do some mountain biking and enjoy some epicurean delights. Two September weekends offer wine and gourmet food in Summit and Eagle counties — Gourmet on Gore in Vail from Friday, Sept. 2 through Monday, Sept. 5 (www.gourmetongore.com), and the new Breckenridge Wine Classic, Thursday, Sept. 15 through Sunday, Sept. 18 (www.breckenridgewineclassic.com). Both feature a number of Colorado chefs, wineries and spirits purveyors from around the country, plus tastings and seminars to help you appreciate the finer points of dining and sipping. In Vail, we recommend the open-air tasting in Vail Village on Saturday, Sept. 3, paired with a ride on the intermediate Son of Middle Creek trail, accessed from Red Sandstone Road in Vail. This trail offers great leaf viewing opportunities, as well as a chance to burn off all of that delicious food. At the Breckenridge Wine Classic, foodies will enjoy wine seminars, a farm-to-mountain wine dinner and a tapas-and-wine lunch. Organizers encourage attendees to get into the mountains with events such as Savor the Singletrack. Attendees will ride with executive chef Matt Fackler, of Relish, master sommeliers and avid cyclists Damon Ornowski and Sean Razee and retired pro racer Tammy Jacques. The ride ends with a lunch prepared by Fackler. Event producer Katie Schultz said she sees increasingly more people looking to combine activities and unique experiences with culinary events.